Designed for smaller hot runner system applications, the LEC is offered with 2, 6 and 12 zone enclosures. The LEC features a modular design for simple control card removal, addition or replacement. An optional network module allows users to link two 6 or 12 zone enclosures together for up to 24 zones of control. All 6 and 12 zone LEC enclosures come prewired to accept the network module, so the module can be ordered up front or added at a later date. With the addition of the network module, the LEC becomes truly full-featured by offering security options, remote input, alarm output, and Gammaflux software including Gammavision, Mold Doctor and Field Calibrator (with a customer supplied laptop or personal computer). The network module also enables a link to plant monitoring systems. 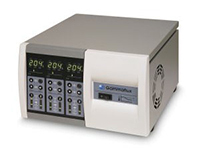 Control - the proprietary self-optimizing Gammaflux PID2 control algorithm adjusts if the actual temperature deviates 0.1Â°F (0.05Â°C) from setpoint. The second derivative (PID2) monitors the actual temperature rate of change. As a result, the LEC module regulates the output to the heater in advance of achieving setpoint to limit or eliminate over or undershoot. Actuate - using phase angle fired output, the Gammaflux controller delivers smooth and exact power to each heater in 0.24 VAC increments for the ultimate in temperature control. In addition, Gammaflux controllers feature mold protection through closed loop wet heater bakeout. 120 times per second (at 60 Hz), Gammaflux controllers check every heater for a short, steadily ramping up the voltage for the fastest possible time to setpoint. If the heater is wet or shorted the output is adjusted within 8.3 milliseconds to protect the heater, cables and controller.